Time: 10:00am - 3:00 p.m. 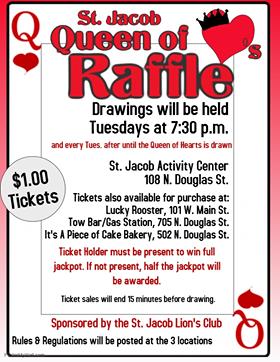 Drawings will be held Tuesdays at 7:30pm (and every Tuesday after until the Queen of Hearts is drawn.) at the St. Jacob Activity Center, 108 N. Douglas St. Ticket Holder must be present to win full jackpot. If not present, half the jackpot will be awarded. St. Jacob Activity Center: 108 N. Douglas St.
Lucky Rooster: 101 W. Main St.
Tow Bar/Gas Station: 705 N. Douglas St. It's A Piece of Cake Bakery: 502 N. Douglas St.
We have purchased CodeRED Weather Warning to alert citizens in the path of severe weather. 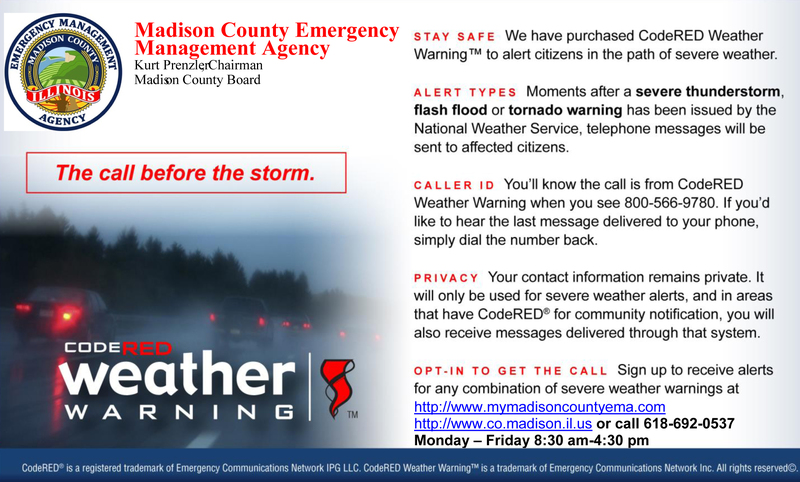 Moments after a severe thunderstorm, flash flood or tornado warning has been issued by the National Weather Service, telephone messages will be sent to affected citizens. When you see 800-566-9780 displayed, you will know the call is from us. If you would like to hear the last message delivered to your phone, simply dial the number back. 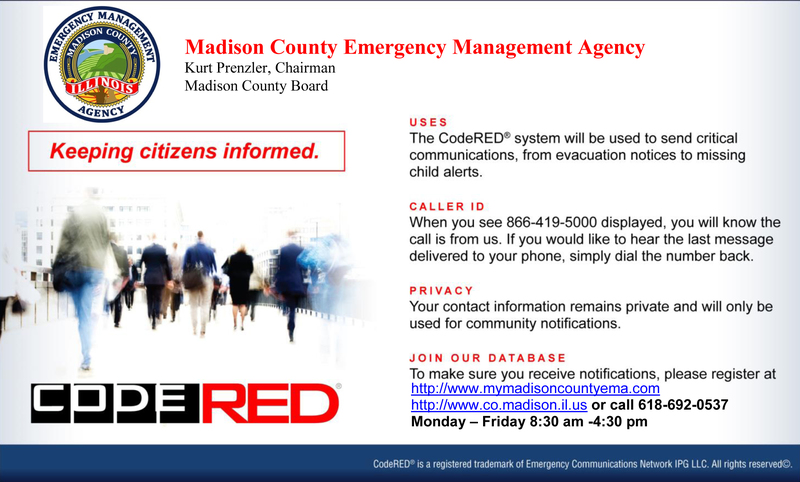 Your contact information remains private and will only be used for severe weather alerts and in areas that have CodeRED for community notification, you will also receive messages delivered through that system. 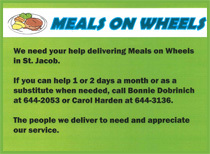 We need your help delivering Meals on Wheels in St. Jacob. The people we deliver to need and appreciate our service. In an emergency precious time counts, if we cannot find your address we cannot help you. 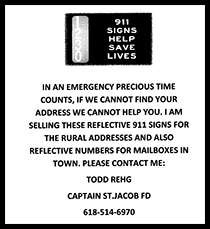 I am selling these reflective 911 signs for rural addresses and also reflective numbers for mailboxes in town.